Did you know receding gums are the first sign of gum disease? When the gums recede, space is opened up and bacteria fill that void and wreak havoc on your dental health. While there a lot of reasons gums begin to recede, from poor dental health to aggressive brushing, there are a number of all natural ways to control the deterioration of your gums. Green Tea has been shown to reduce the inflammation of the gums and fight against bacteria trying to get into the spaces in your mouth. Drinking a single cup of green tea every morning will keep teeth strong and the gums healthy. Using 1/4 cup of Sesame Oil like mouthwash will remove a number of toxic substances from your mouth. The oil also puts a protective coating around the teeth and gums, essentially keeping them free from dental and gum decay all day long. Using Aloe Vera like toothpaste will help fight gum disease. While it helps with healing gum disease, it can also be used to prevent gum disease. Simply brush your teeth like you would normally but with aloe vera instead of toothpaste. Receding gums are the first sign of gum disease which means taking good care of your gums is important. 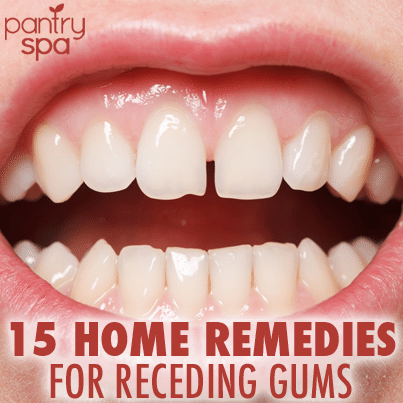 Here are some natural remedies for receding gums. It’s important to know these things will only manage, not treat, receding gums. Ok, so what is the treatment if this is only to “manage” receding gums? So far my dentist hasn’t done anything to “treat” it and I’ve been doing more of the effort which is fine but really don’t appreciate you pointing things out without the reason…so do us a favor and post a comment that is more helpful.